About This Game: Operating directly under the National Command Authority, a relatively unknown entity of Operators. Over 2 million Soldiers, Sailors, Airmen and Marines wear the uniform. Of those, approximately 50 thousand fall under the direct control of the Special Operations Command. The Tier 1 Operator functions on a plane of existence above and beyond even the most highly trained Special Operations Forces. Their exact numbers, while classified, hover in the low hundreds. They are living, breathing, precision instruments of war. They are experts in the application of violence. The new Medal of Honor is inspired by and has been developed with Tier 1 Operators from this elite community. 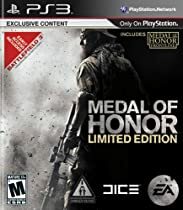 Players will step into the boots of these warriors and apply their unique skill sets to a new enemy in the most unforgiving and hostile battlefield conditions of present day Afghanistan. New Updates to the Medal of Honor Page! Check out the guides section to view more!